Gasteria is a genus of succulent plants endemic to southern Africa. Gasterias are distinguished from the related genera by their curved pendulous pedicels and belly-shaped, curved perianths, and the genus is also named for the stomach-shaped flowers (“gaster” is Latin for “stomach”). 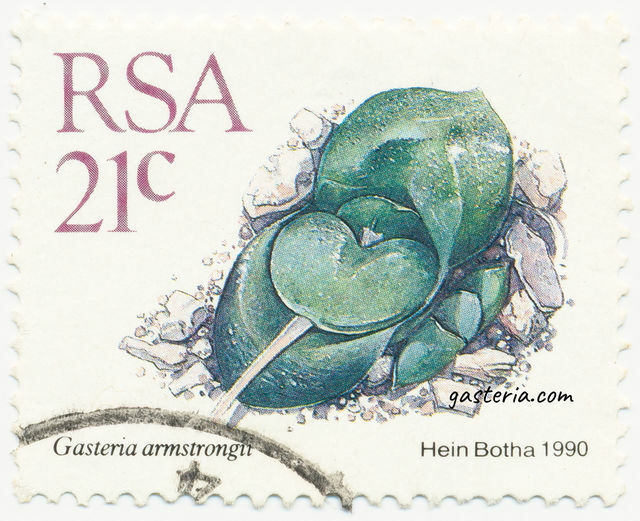 Gasterias have succulent leaves arranged in rosettes or arrays (distichous). Their leaves are straight or slightly arching, varying from smooth and shiny to rough and sometimes even pebbly. Their sizes range from 2 cm to near 1 m, depending on the species. These strange plants have an irresistible appeal for collectors, from as early as the 17th century. The genus contains ~20 species and most are native to the Eastern Cape Province, South Africa. A few species extend across the low-altitude coastal belt regions, from the far south-west corner of Namibia to the Lebombo mountains of Swaziland. Gasterias should be managed in the same way as the other genera in the Aloeae tribe like Haworthias and Aloes. Please refer to the sister site www.haworthia.com for related articles. In general, Gasterias are often sturdier and easier to be managed than Haworthias. However, Gasterias are more prone to black spot problem as the result of fungal infections. It is recommended to keep a good ventilation and apply a systematic fungicide at least twice a year.